Moseley v Ampthill. Picture: Harish Chavda. Ampthill moved second in the National One table with 11 games to go with a 35-18 victory at Birmingham Moseley on Saturday. Trailing 15-7 at the break, Ampthill ran in four second-half tries; three of them came in a 13-minute spell, that finished the game as a contest and ensured the visitors collected the bonus point that moved them above Plymouth Albion in the third tier of English rugby. Ampthill’s director of rugby Mark Lavery said: “We started slowly but take nothing away from Moseley, they really came out the blocks quickly and caused us all sorts of problems and being candid – we were a little soft early on. “I’m not sure if they thought at half time that they’d got the job done but we came out in the second half and tore into them. 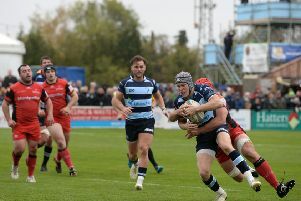 “We conceded a penalty with 15 minutes to play to trail 18-14, that’s when we really responded – you could see a physical change in the boys, and frankly, we’ve just hounded them into the ground. Ampthill’s try scorers were Aleki Lutui, Maama Molitika, Joe Bercis, Paino Hehea and Alex Mitchell with Joe Tarrant on target with all five conversions. “The forward pack were absolutely magnificent,” added Lavery. “They put a real shift in and the back three of (Matt) Burke, (Maama) Molitika and (Joe) Bercis were extraordinary. “For Joe to return to his home club and play as well as he did, and respond as well as he did is a mark of the player this young man is beginning to become” said Lavery on the openside flanker’s performance, whose decisive try, Ampthill’s third, edged the A’s ahead. “The double over Moseley is special but we’ve big games to come and next weekend’s home game against Macclesfield is a massive one – they’re down there at the foot of the table fighting for their lives”. The action gets underway at Dillingham Park on Saturday at 2.15pm.